The U.S. Department of Homeland Security (DHS) requires that every State and urban area conduct an annual Training and Exercise Plan Workshop (T&EPW). As a result, Florida conducted its Multi-Year T&EPW in April 2010 and has since produced a proposed MYTEP. The State of Florida has pursued a coordinated homeland security strategy that combines enhanced planning, new equipment purchases, innovative training, and realistic exercises to strengthen the State‟s emergency prevention and response capabilities. Training and exercises play a crucial role in this strategy, providing the State with a means of developing, practicing, validating, and improving capabilities. The MYTEP provides the linkage between the strategy and the supporting training and exercise activities. 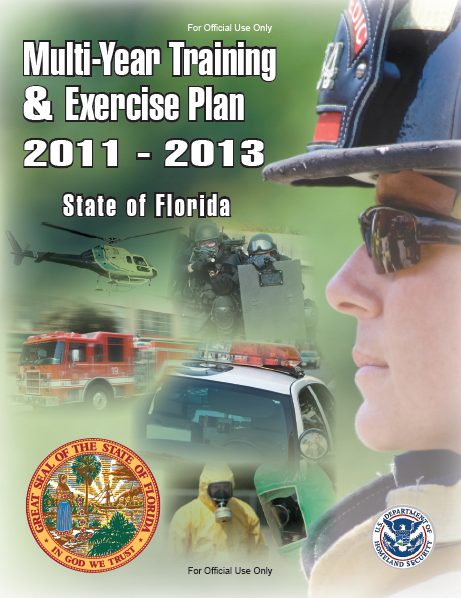 The State‟s training and exercise programs are administered by the Florida Division of Emergency Management, in coordination with its local, State, Federal, and private partners. The training and exercise agenda described in this plan is contingent upon funding for the identified State-level response agencies and collaborating jurisdictional response stakeholders.